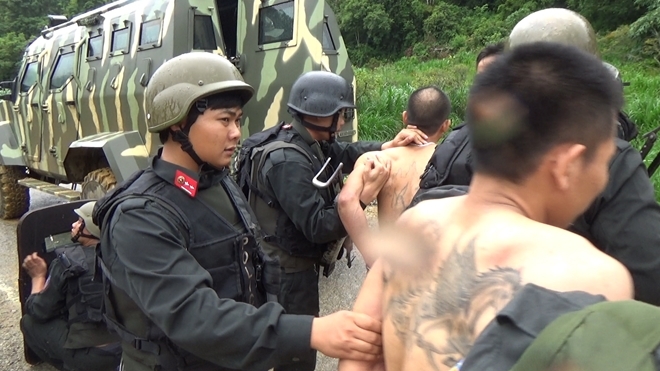 PSNews - After 48 hours blockading the safe haven and exchanging fire with drug traffickers in Ta De village, Long Luong Commune, Van Ho District, Son La Province, on June 29th 2018, task-force teams of the High Command of Mobile Police and other police units annihilated 2 dangerous drug trafficking lords namely Nguyen Thanh Tuan and Nguyen Van Thuan. The victory demonstrated a high sense of responsibility, resolve, courage, resourcefulness and creativity of the Mobile Police Force, particularly the special task-force police. They have successfully fulfilled the assigned tasks while ensuring absolute safety. Lieutenant General Pham Quoc Cuong, Commander of Mobile Police said, after receiving the Direction of the Steering Committee and the Investigation Committee about the drug trafficking ring, the High Command of Mobile Police drew up a plan and submitted to Senior Lieutenant General Le Quy Vuong, Deputy Minister of Public Security. The Deputy Minister reviewed the combat plan and ordered nearly 100 police officers and soldiers under the Special Task Police Battalion No.1, in coordination with other police units to conduct the operation. At 8 am on May 26, the joint force contingent quickly maneuvered to Son La. "This was a special task as we have to fight against extremely dangerous drug trafficking lords who were ready to use weapons to fight back. Thus, we carefully prepared for the operation, and well coordinated with one another in performing our assigned tasks. The operation was highly appreciated and supported by the leaders of the Party, the State, local authorities at all levels and local people. The courage and resolve to fight criminals of the participating police forces have left a good impression on local authorities and people," Lieutenant General Pham Quoc Cuong, Commander of Mobile Police recalled. On June 27, the special task-force police in coordination with other police units carried out a two-day raid on the drug trafficking group. At first, the police spent hours persuading the drug traffickers to give themselves up to the police to enjoy the leniency of the law. However, the drug lords denied and used weapons to fight back the participating forces fiercely. The police teams then decided to attack the criminal group. Thanks to the courage and excellent tactics of the joint police contingent with a majority of special task-force police officers of the High Command of Mobile Police annihilated 4 suspects, captured 3 others, seized 17 grenades, 49 guns, over 7.000 bullets, 11 gasoline cans and 11 gas cylinders while ensuring absolute safety for all police officers, soldiers and people. 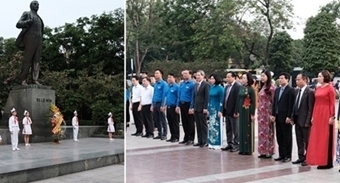 In recognition of this special achievement, on June 28, Prime Minister Nguyen Xuan Phuc sent a compliment letter, praising the Son La Provincial Police Force and the High Command of Mobile Police for their excellent feats. Speaking at the conference to review the operation, Senior Lieutenant General To Lam, Politburo's member, Minister of Public Security affirmed that this feat contributed greatly to the effort to fight against drug-related criminals in the whole country. This is one of the victories that the High Command of Mobile Police has achieved over the past time in dangerous battles against crimes. As a core police force equipped with various special weapons to protect security and ensure social order and safety nationwide, the High Command of Mobile Police has always been present at the most perilous places and face the most dangerous criminals over the past years. In 2018, the High Command of Mobile Police mobilized over 2.7 million times of its police officers and soldiers to ensure absolute safety of 644 targets, 491 national-level events and activities, and over 8,300 shipments. The force also deployed thousands police officers and soldiers to crack down on large criminal cases.